Go Realty Unplugged: Party With A Purpose! As you all know, we open up Go Holly Springs to local groups & organizations as a way of giving back to the community. I'm really excited to share with you a very special event that is happening at Go Holly Springs THIS Saturday because we are all invited! 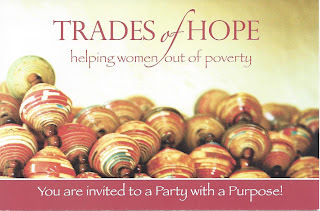 Trades of Hope is an organization that couples American women with women living in poverty around the world. At Trades Of Hope parties, hand-made items are for sale just like other home parties, but these handicrafts are made by women who are receiving training to help support their families and will receive fair trade payment for their items. The party will be from 1:30-3:30 and will include refreshments and shopping as well as an inspirational video with stories of the women who create for Trades Of Hope. Get an early start on your Christmas Shopping while helping a wonderful organization! We'd love for you to stop by for a few minutes & check it out!